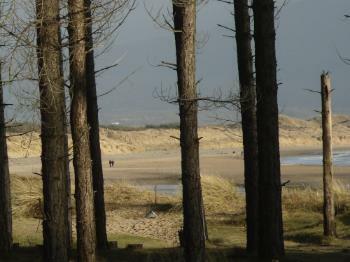 Through Newborough Forest and down to Llanddwyn Beach. 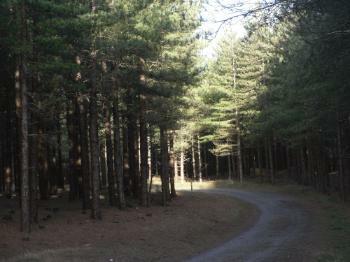 Newborough Forest. Do you care for the wind susurrating through tall Corsican pines and soaring, croaking ravens as the soundtrack to a long peaceful walk to clear your head? You do? 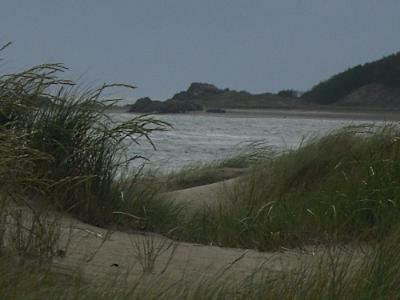 Then a walk through the Forest to Llanddwyn Beach and Llanddwyn Island is the ideal spiritual specific for you. 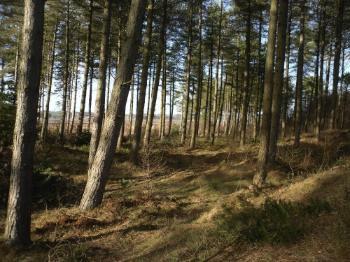 It’s not the whiplashing that draws me to Newborough Forest. Indeed not. Never tried it. Just not the submissive type. It’s the last bit. The Peace & Quiet. Whether in Spring, Summer, Autumn or Winter walking through this large forest I find myself able to escape those pressures of life that we too frequently embrace. We really should be cleverer than that. Either, I walk along the forest track all the way down to the beach or I just head left or right along the well trodden paths among the trees. From the Malltraeth Cob carpark it’s about a 50 Minute Walk for me to the sea. I’m sure I could do it quicker; I just allow my troubled spirit to set the pace. Take care though, if your mind begins to wander then there’s a danger you’ll find yourself in the ditch because of the road camber. There are no facilities at all other than that which offers sweetest relief. Of course should you be walking in the general direction of Llanddwyn Beach then you’ll find drinking water and toilet facilities there at the carpark. It’ll be a bumpy old ride for wheelchair users. Yet, it’s a very real place to be. Away from any human habitation. 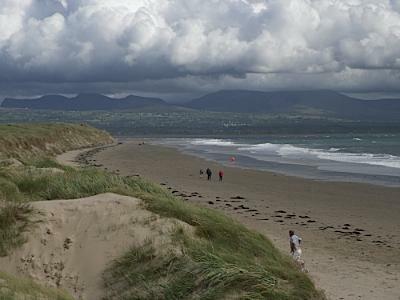 It’s relatively easy to get to Newborough Forest and the Llanddwyn and Newborough Beaches. Follow this road for about 20 minutes past Plas Newydd Estate on your left, though the village of Brynsiencyn. Into the country again and past the village of Dwyran on your right. Out of Dwyran you have The Mile Road (Lôn Filltir) turn up right at the roundabout. 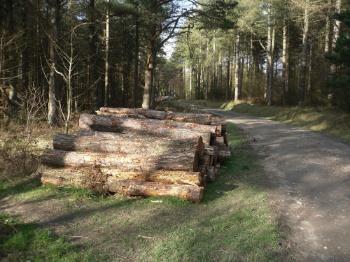 Through the village of Newborough (Niwbwrch) and you’ll find the forest crowding the road after half a mile. The carpark is well signposted on your left – just before then beginning of Malltraeth Cob. Turn in here. If the car park is full, then you may find space on the other side of the road a few hundred yards back. 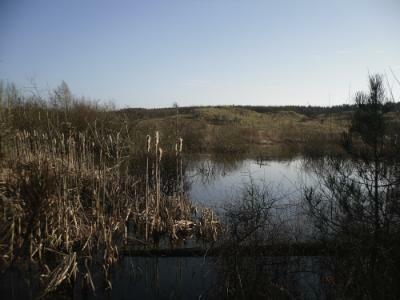 This is Llyn Parc Mawr. The other way is to follow the road south from Rhosneigr past Aberffraw, through Llangadwaladr, Hermon and then turn right for Malltraeth at the junction by the school. Drive through Malltraeth and the forest carpark is on the other side of the cob where the forestry begins. Had you visited the small village of Newborough before the 1940s, then it would have been a regular experience to have sand storms depositing their load on your home and in your lobscouse. Interestingly, during the period of the Second World War the main crop gown in this area was carrots, because, as you know, carrots love the drainage that sandy soil provides them. What was previously a quite open area between the village and the sea was subject to the cruel vicissitudes of the unstable sand dunes between Abermenai Point to the south and Aberffraw Dunes to the north. 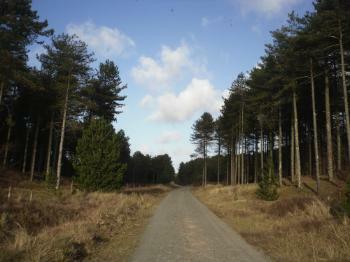 Between 1940 and the early 1970s Newborough Forest was established with about 700 hectacres given over to predominantly Corsican Pine afforestation. The remainder of this 950 hectare is Newborough Warren, salt marsh at Malltraeth and the sand dunes backing both Llanddwyn and Newborough beaches. The main purpose of the afforestation was to stabilise the mobile sand dunes and also create a source of wood, which was a vital national need during the 1940s. 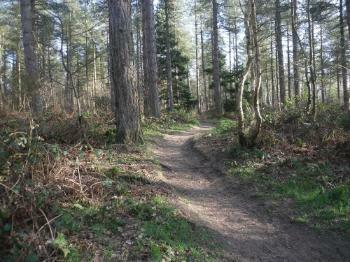 The forest is managed by Forestry Commission Wales on behalf of the Welsh Assembly. You’ll be hard pressed to find a Gray Squirrel in Newborough Forest. That’s because the forest and a few other sites on Anglesey, including Mynydd Llwydiarth at Pentraeth and Beaumaris is now the home of the once endangered Red Squirrel. It’s the Gray Squirrel that now feels endangered. These rusty little critters were introduced into the forest by the Anglesey Red Squirrel Project and a number of other blessed agencies. The forest provides ideal conditions for the re-introduced Red Squirrel, though you’ll be lucky to see them while sticking to the main paths. The large canopy connectivity of the pine trees provides a large habitat, though there are concerns that the clear-felling of certain areas of the forest according to EC Directives may cause a limiting factor for the size of the future Red Squirrel population. I have a few dedicated pages for the Red Squirrel and guide you there at your convenience. 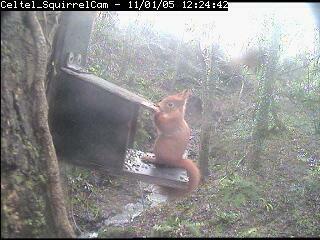 Check out the Squirrelcam on my ANGLESEY WEBCAMS PAGE. During the time that Beaumaris Castle was constructed the entire population of Llanfaes was transferred to Niwbwrch (as we call it). The intervening centuries found this little village inundated again and again by sand blown form the unstable sand dunes. It might have been great for growing carrots (when they arrived in the country) but it was hellish place to live at times. It wasn’t only the sand that was a problem but in certain extreme weather conditions the sea would also inundate the low-lying homes and buildings. So between 1947 and 1965 massive planting of conifers was undertaken with the primary purpose of stabilising the mobile sand dunes. This project also created employment and served a national and then commercial need. 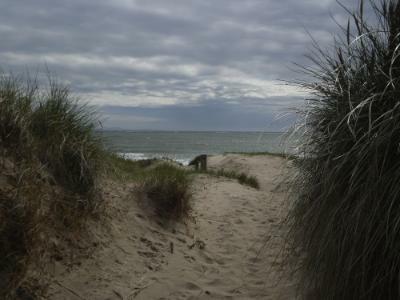 The sand dunes backing from the beach and reaching way back into Newborough Forest are designated as part of the Newborough Warren–Ynys Llanddwyn National Nature Reserve (NNR). The entire are is also designated as an Area of Outstanding Natural Beauty and who can argue with that. 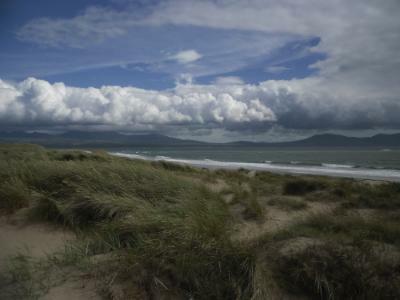 The sand dune area is the largest in Wales and the second largest in the United Kingdom and is managed by the Countryside Council for Wales (CCW). When you visit Llanddwyn Beach and Llanddwyn Island an investigative glance will reveal to you the current work to stabilise the sand dunes. There is the obvious marram grass that many of you my age will have studied as part of A level Biology which acts an initial stabiliser. To this, is added thatched fences. Interestingly enough, I was intrigued to learn that Nature, allowed the opportunity of human management, has also been able to intervene by the natural grassing over of the sand dunes. N.B. – I’m sure that you will be an eminently sensible visitor to the area and keep off the managed sand dunes. The walk down to Llanddwyn Beach is as simple and straightforward as you wish it to be. 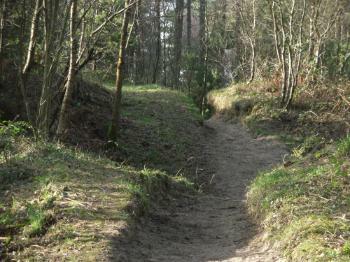 You may choose to wander down some intriguing well trodden path to your left or to your right. Mayhap, you may simply choose to amble a distance in the direction of the beach but find yourself strangely transfixed by the absence of noise of human fabrication – other than laughter – and stop to shut your eyes and just listen. Eventually, though, you will arrive at a point where the road pulls a heavy left-hander and the noise of the sea is loud and the beach, the water and Llanddwyn Island is there right before you through the trees. There is always something primal about stepping out of the forest into the clear. We always seem to hesitate at such transitions. Newborough Forest now lies behind you and the broadest beach on Anglesey lies before you, stretching all the way from Abermenai Point to your right, past Llanddwyn Island and along Newborough Beach to the Cefni Estuary. Take your shoes off and reach back to your best childhood memories. Would you care the share a thought or make an observation. Return from Newborough Forest to NEWBOROUGH MAIN PAGE.